Who will have the bragging rights after your staff Christmas party? There’s only one way to find out and that’s to book a Christmas party in Swansea playing Paintball or Laser Tag at Teamforce Swansea! Your staff Christmas parties will never be the same again. Get your colleagues out in our woodland paintball and Laser Tag zones and find out who will have the bragging rights in your team? Whether it is action packed paintball or state of the Art Laser Tag (like Call of Duty) at Teamforce Swansea for your Christmas works do, there is plenty of fun on offer and it’s a great way to start the party before the inevitable tall tales later in the day after a couple of shandies! 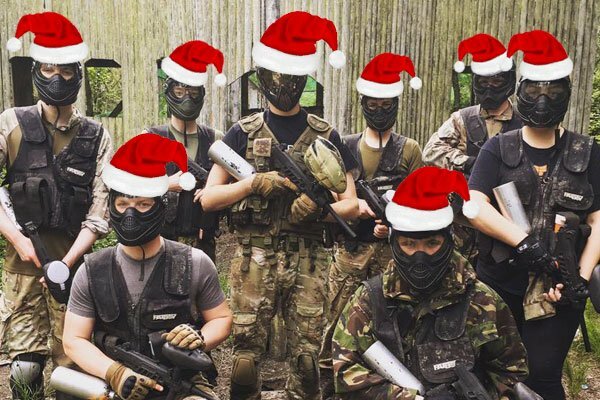 Christmas always seems to creep up on us sooner than we expect so whether it is full on paintball or Laser Tag, at Teamforce Swansea we will provide your staff a day to remember. At Teamforce we have entertained loads of corporate customers over the years and we will help make it as easy as possible to organise a truly memorable staff Christmas party. Click here for our Christmas Parties FAQ’s. Don’t delay, book your Christmas party above or by calling us on 07541 512405 to book over the phone, or click here info@teamforceuk.com to email us. Great incentives for Christmas party group organisers. Ask us about our incentives and deals for your Christmas parties in Swansea. Click here to download our Christmas party poster to put up in your work place. Click here for Frequently Asked Questions about Christmas Parties at Teamforce Swansea.